I wanted to use this column to write about a few things in the news of interest to us martial artists. As I said decades ago – war is obsolete in the future, so 'pretend now' that things are getting better. As freedom loving folks come to America, they learn like all others that came before them, that indeed we are a country of law and order, separation of church and state and realize it is not whether you win or lose, but rather 'how you play the game.' After all, the blessings of freedom paid by our own forefathers demand a certain respect that has already been won. Others need not honor that, but if they are these new Central American influenced 'gangs' we are hearing about, a bill pushed by the House now makes gang attacks punishable by Federal law. This new bill expands the range of gang crimes punishable by death, establishes minimum mandatory sentences, authorizes the prosecution of 16 and 17 year old gang members in Federal court as adults and extends the statute of limitations for all violent crimes from five years to fifteen years. Quoting an article by Erica Werner of the Associated Press, Rep. Randy Forbes, R-VA, the bill author had this to say – "If you join a violent criminal gang and you commit a gang crime, you’ll go to jail for a long time or you'll help us bring down that network." Rough Justice Department statistics estimate there are 25,000 active gangs in 3000 jurisdictions across the country adding up to 750,000 gang members nationwide. Add population increase and things might look worse than the same rise in technology does to make crime more obsolete as they realize it is best for their material welfare. A quick look at technology in the news reminds us that in dire straights, i.e. war or rampant anarchistic chaos, that we can now chip humans! VeriChip is the first tag patented and marketed for use in humans. Some suggest an estimate of 8000 have been sold to distributors since 2002. The chip is the size of a grain of rice. A syringe injects it for about $200. Radio frequency identification is referred to as REID technology. They are used as wireless bar codes, receivers and transmitters of data via radio waves, assembly to store shelf tracking and movement of livestock and pets. Now they are being used to tag humans. Customers from Latin America use them to avert kidnappings. Officials in the Mexican Attorney General's Office have already been implanted to access high security areas. Another version is a small high tech camcorder that fits in a normal size gelatin pill. A hard drive is placed on the body and a monitor can show the insides! In a freedom loving country, one might argue that chipping government enemies might well be considered 'progress' and much cheaper than internment. Let the masses yearning come here to be free, just obey the law and as our country's old flag said, "Don't tread on me." God is Love - act like it or suffer. On another note of interest, a Federal Judge overturned the FDA's ban on ephedra. The ban it seems was too broad, thus a dose of no higher than 10 mg was approved for one company's product in a Utah hearing. The ruling related to a product of one company only. I told folks decades ago we need the government to not only regulate medical cannabis, but also regulate wine internet commerce and many other creative ways of generating income needed to fight lack of food – the number one cause of war. 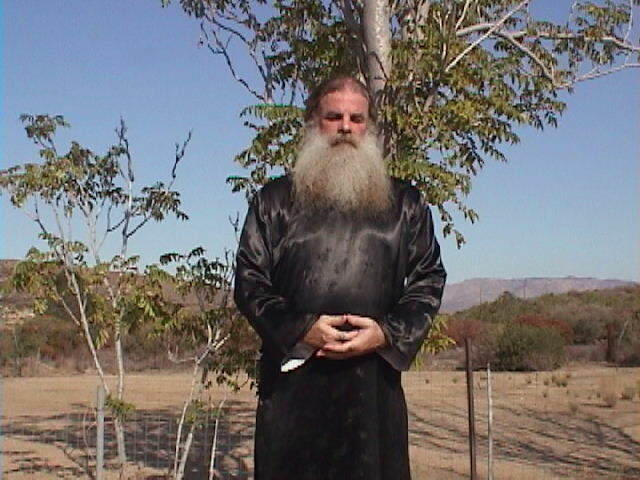 I am a martial shaman and am fascinated at how secretive history is in telling the truth about the importance of 'the leaf of the tree.' Because biotechnology patents names for every remedy, it seems logical to be based on the name of a simple common plant; be it Latin, Pharmaceutical or English Common Name. In other words, sometimes but not always the over the counter remedies often leave us in ambiguity as to the natural God given source. If science is grafting itself off the basics or roots of the medicine of Melchizedek and his student Abraham which was then later incorporated by their Oriental missionaries returning to their studies at Salem over 4000 years ago, then cooperation needs to be the key word instead of even 'healthy competition.' Truth and freedom alone censor science, religion and philosophy. Back to the news in the medical arena – Remember folks I only point areas to reflect on. There was a positive article about the biotech work of Dr. John Eng of the Bronx Veterans Administration Medical Center in New York. Eng discovered that the saliva of the Gila Monster had the potential to treat diabetes. The endangered lizards' poison stimulates the body's production of insulin, a hormone that helps cells process blood sugar. This reminds me of how many more so-called heathen remedies will be 'unveiled' with science grants. The ma huang of Chinese medicine is the plant biotech companies buy in bulk from Asia to make most all the effective cold medicines sold over the counter. Another herb of late being smeared is Echinacea, but science should be trusted in that when they do identify the plants' helpful ingredients, which they will in my opinion, rest assured they will be the first to admit the progress. It is much like the stand on medical cannabis. To say there is no medicinal quality in the flower buds is like asking the Pope to explain just exactly what the verse in Ezekiel (Old Testament) means when asserting that "of the fruit of the tree shall be for mans' meat and the leaf thereof for his medicine." In reality there is no such thing as a 'weed.' The term 'weed' is used mostly by the uneducated that simply do not know the true name, history and indeed science of the particular plant. Science corrects itself in time when necessary. Recently in the paper there was an article on the castor bean plant. It seems that the beautiful plant has become fashionable to landscape with. The downside of course is making sure the beans are not left on the plant for children or pets to chew. The castor bean is the source of deadly ricin, thus quite deadly and nothing to plant in my opinion. Another popular highway foliage scrub here in southern California is oleander. My former teacher once said, "Jim, martial arts are everyone's ego." He also said that health made wealth and that herbs and meditation are what made an art 'internal.' So important was herbal knowledge that his father, the fifth generation Jung Shee, had him accompany him on herb walks at toddler age! The new testament sates: "physician heal thyself." We need to give western medicine respect for being the most advanced in the world, despite what the eccentrics say. At the same time, while all cultures have their folk healing, nevertheless, I think there is no question that science has chosen Chinese medicine to graft onto and study. Chinese medicine is not the oldest by any means, but oriental medicine in general if one includes Ayurvedic, Tibetan, Korean, Chinese, Unani and Japanese variations, do seem to reflect Melchizedek/Abraham truisms. Lest one not particularly be interested in any of the oriental branches of medicine, they might enjoy the rich study of not only Native American, but English settler good old fashioned American natural healing folklore. All of you should have a copy of the late Jethro Kloss' "Back to Eden" naturopathic handbook and perhaps its quasi equivalent from a different point of view called "The Chinese Barefoot Doctor's Manual." These two 'primer' books are cheap and readily available. I will wrap up this short column with a photo of a formula sealed for over 20 years. I will now share what my former teacher typed on the package, which also included the original herbal list in original writing and the most toxic ingredient 'castor bean.' Remember though not to try this. We are merely sharing a bit of the past. Why the monks would have thought that the said ingredients when prepared right in those days, would have the fabled results, remains for us to study scientifically. Secrets do not advance ethics! Science will help us the most when they cooperate with philosophy and religion. We need to get back to our human families' pool of herbal knowledge. Indeed because 'the garden' is the whole earth, we need cooperation for the shaman worldwide to share their passed down cultures so that western medicine for the most part can validate similarities. I am going to type the following exactly as it was written so as to preserve the original ambiance. That said, excuse any typos or incorrect grammar in the original. I am adding quotes as it was from my former teacher. 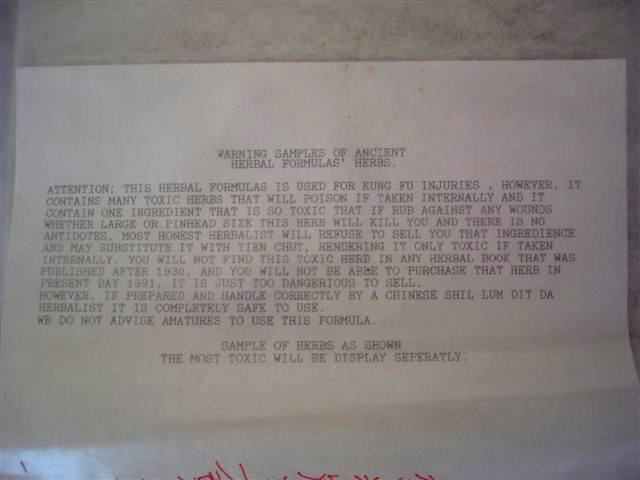 ATTENTION: THIS HERBAL FORMULA IS USED FOR KUNG FU INJURIES, HOWEVER, IT CONTAINS MANY TOXIC HERBS THAT WILL POISON IF TAKEN INTERNALLY AND IT CONTAIN ONE INGREDIENT THAT IS SO TOXIC THAT IF RUB AGAINST ANY WOUNDS WHETHER LARGE OR PINHEAD SIZE THIS HERB WILL KILL YOU AND THERE IS NO ANTIDOTE. MOST HONEST HERBALIST WILL REFUSE TO SELL YOU THAT INGREDIENCE AND MAY SUBSTITUTE IT WITH TIEN CHUT, RENDERING IT ONLY TOXIC IF TAKEN INTERNALLY. YOU WILL NOT FIND THIS TOXIC HERB IN ANY HERBAL BOOK PULISHED AFTER 1930, AND YOU WILL NOT BE ABLE TO PURCHASE THAT HERB IN PRESENT DAY 1991. IT IS JUST TOO DANGEROUS TO SELL. HOWEVER, IF PREPARED AND HANDLE CORRECTLY BY A CHINESE SHIL LUM DI DA HERBALIST IT IS COMPLETELY SAFE TO USE. WE DO NOT ADVISE AMATURES TO USE THIS FORMULA. THE MOST TOXIC WILL BE DISPLAY SEPARATELY." I added the quotes to remind you that was my former teacher's broken English coming out and to merely appreciate he wanted to 'share' … and appreciate that he knows more than one language. I don’t think in modern times we need to use this formula at all in its original form, rather we should study Chinese medicine and the myriad of ways yin/yang created the 'laws' of Chinese medicine as it has evolved in the 'now' of 2005. More on the lifetime study of "the leaf of the tree" in further columns. 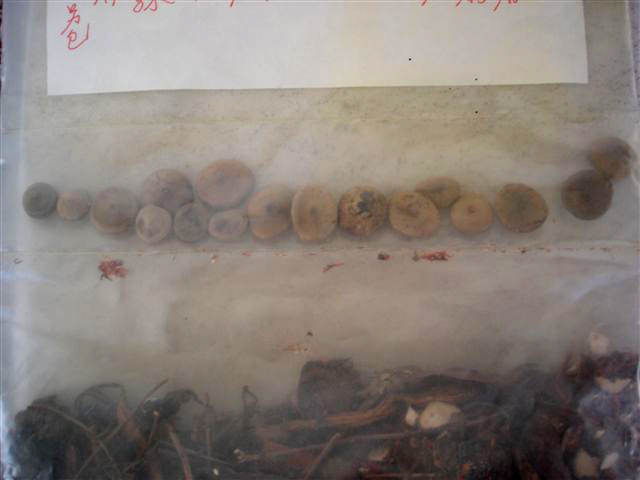 Remember – Do not mess around with Castor beans! Obey all laws and always consult your doctor.